News ! 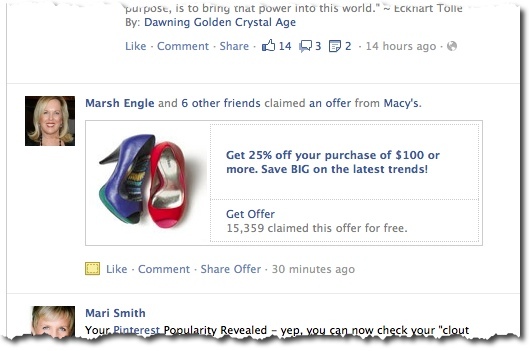 Facebook is running tests on ‘Offers’ for business pages. Read more …. from the great Facebook marketer Mari Smith…. The Offer jumped out at me in my News Feed last Thursday when a friend of mine (plus six others!) claimed the Offer. Then I saw the Offer repeatedly in my News Feed, so clicked through to Macy’s to check it out on their wall too. Simple, one-click claim – INCLUDING on mobile! What’s super exciting about this new Facebook product for businesses, is the absolute simplicity and ease with which users can claim the Offer. Literally ONE click and Facebook lets you know the Offer is in your email inbox! 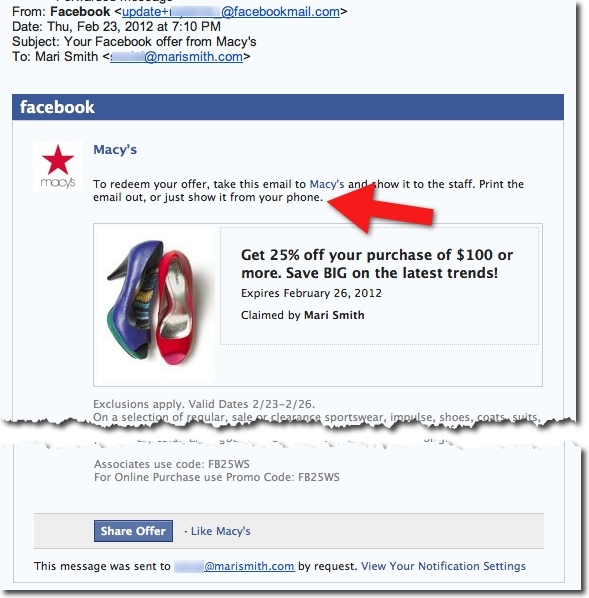 One click on “Get Offer” and Facebook emails you details! Users can claim the Offer from the wall of the brand’s fan page. Or, users can claim the Offer from their News Feed. Including MOBILE. Hello? Yes, mobile. Now that is thrilling. More than half of Facebook’s 845 Million active users access the site via their mobile devices. Imagine the possibilities of Offers for your business! For local businesses. Wow. I haven’t been this excited about a new Facebook product since…. well, since last September when Subscribe came out. 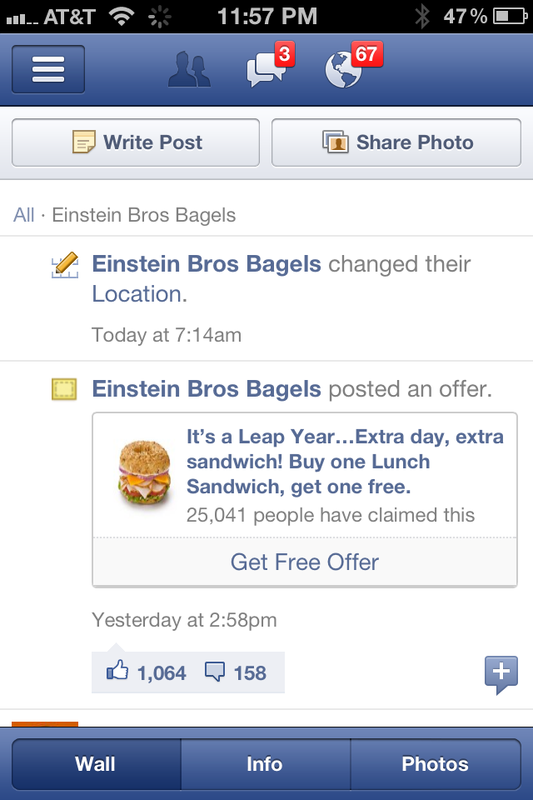 Credit to AK Stout and this post on SayingItSocial.com where a commenter pointed out the Einstein Bros Bagels offer. And, notice the big “Share Offer” button in the email. LOVE that. Boom – one-click claim. Instant gratification. And another one-click to share with friends! The offer was clean, simple, obvious and used a “%” sign and a “$dollar” amount. The choice of verbiage in the Offer was compelling: starting with “Get” (mirrored with the “Get Offer”), and the use of “save” and “BIG.” Clever! 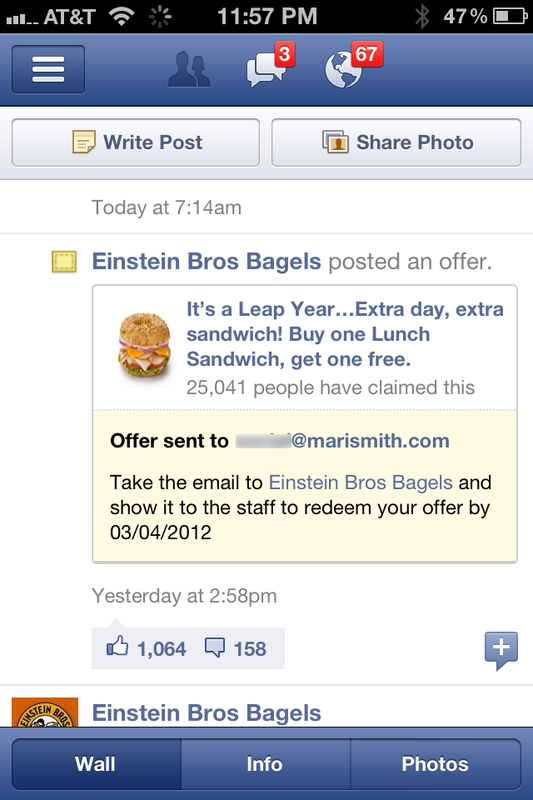 Macy’s first posted the Offer on February 23rd, and posted it again on February 25th (Saturday morning at 7am Pacific) with the the description “Just two days left to get a head start on spring shopping!” (Einstein Bros Bagels did the same repeating of the Offer on its fan page wall, which of course goes into the fans’ News Feed again). 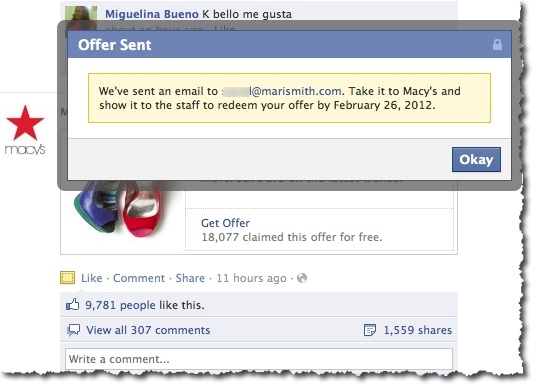 Ultimately, 41,602 people claimed the Macy’s Offer. And the original Offer post was shared a total of 2,491 times and the reminder of the Offer shared 374 times. Awesome social proof! See also Build-A-Bear Workshop‘s Facebook page for this Offer. (Credit to AK Stout for spotting it). Congrats, Facebook. I do believe you’ve found simplicity on the other side of complexity with this new Offers product. Will Offers be one of the BIG new product launches announced at the Facebook Marketing Conference today? Rumor has it Facebook is unveiling a whopping 7 new changes/products/upgrades. We know that one will be Timelinefor Pages. Another is new Premium Ads. And a third surely has to be these Offers—well, in fact I understand that Offers is part of the new Premium Ads product. [Update: turns out Offers are a standalone product and appear to be FREE to create and share! Select Pages only, so far.] And, I heard last Friday from a reliable source that currently only around 25 big brands even know about Offers. Hm, still, I sure hope the product is imminent for the rest of us. Stay tuned for more. I’ll be watching the Livestream of the FMC and tweeting and posting my thoughts on my Facebook page and profile.